Bomb Jack is an arcade platform game that was released in 1984 by Tehkan (known today as Tecmo). It was followed by two official sequels, the console and computer title Mighty Bomb Jack, and the arcade game Bomb Jack Twin. 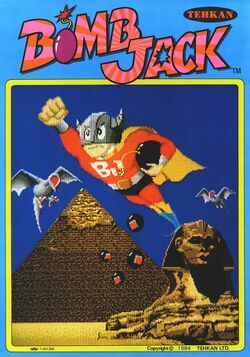 There was also Bomb Jack II, a licensed follow-up developed for 8-bit home computers by the European games publisher Elite Systems. The game has also inspired a number of recent conversions, including to the Mobile platform in 2003, the 8-bit MSX2 computer in 2004, and the XL/XE consoles of the Atari 8-bit family in 2008. The player controls Jack, a superhero who can leap and glide. Someone has planted 24 bombs at famous tourist sites (the Sphinx and Great Pyramids, the Acropolis, Neuschwanstein Castle in Bavaria, and two cityscapes resembling Hollywood and the New York City skyline, which appear as stage backdrops). Jack must fly around the screen to collect the bombs. Each screen uses a different configuration of platforms upon which Jack may run and jump. Eventually, the levels reoccur a number of times with increasing difficulty. Jack "defuses" the bombs by simply touching them. As soon as he has touched the first, he triggers a sequence in which another bomb's fuse lights up, and so on. A player can score a bonus in each round by touching 20 or more bombs in the correct lit-fuse sequence. Jack may also defuse an unlit bomb by touching it, but this impedes his opportunity to score the bonus for that screen. It also delays the appearance of the game's bonuses and power-ups. The lit fuses have no strategic purpose other than the bonus; a lit bomb left unattended does not explode. Some of the background music of the game are licensed from popular sources. The music of Round 1 is the ending song from the Japanese animated cartoon series "Spoon Obasan", sung by Mari Iijima. The music of Round 2 is set to the music of the Beatles' Lady Madonna, which had been licensed by Tehkan. This page was last edited on 28 June 2012, at 05:24.